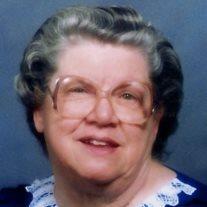 Donna Mae Merrill Magnusson, a beloved wife, mother, and grandmother died on May 19, 2014. She was born in Southgate, CA on January 23, 1927 to Charles and Lenore Merrill. Donna was raised in California. In 1944 she married Eldon Magnusson in the Mesa Arizona Temple and Eldon was assigned overseas shortly after. They were gratefully reunited in 1946 and in 1955 moved to Mesa, Arizona. They dedicated their lives to the service of their family and the Lord. Donna became the mother of seven children and created a home that seeped goodness and warmth. She was devoted to her callings in the Church of Jesus Christ of Latter-day Saints but Primary was her favorite, serving many years as both a ward and stake Primary president with a special love of Primary music. Donna also cherished her twenty years of service as a temple worker. Donna became Grandma in 1967 and eventually the grandmother of 31, great-grandmother to 58 and great-great grandma to five. Grandma’s home was the hub of an expanding family and a favorite place to be. She was Grandma with a capital “G” and adored by her grandchildren. Grandma had a generous, caring heart and an unstoppable enthusiasm for her family. She loved good conversation and an evening around the piano. Christmas Eve’s at Grandma’s house are legendary. Every member of Grandma’s posterity owns at least one treasured quilt that she stitched herself, but Grandma’s greatest masterpiece as a quilter was her family. We thought she was just making quilts, but she was really stitching, and binding us together as individuals and as a family. The binding she cared most about were her covenants and the eternal layers of Grandma’s quilt were faith, God and family. This is her priceless legacy to us. Donna is survived by her children, Pennie Scadlock, Kevin Magnusson (Judy), Donell Heywood (Alan), Keith Magnusson (LaDonna), Wayne Magnusson (Heather), Maureen Magnusson, her brothers, Paul and Norman Merrill, and her grandchildren. She is preceded in death by her husband; son, Carl; her parents; and brothers, Charles and Gale Merrill. Grandma had a wonderful sense of humor and always told us she intended to “Sing Her Way Home.” We think she did just that. Funeral services will be held on Friday, May 23, 2014 at 11:00 am at the Mesa North Stake Center, 933 E Brown Rd. in Mesa. Viewing one hour prior to the service. Interment at Mesa Cemetery. Arrangements by Bunker’s Garden Chapel.